Works in progress in potter, concrete artist, and teacher Leslie Martin Smith’s Roebuck Springs studio. 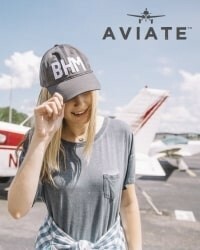 Photo by Sharron Swain for Bham Now. 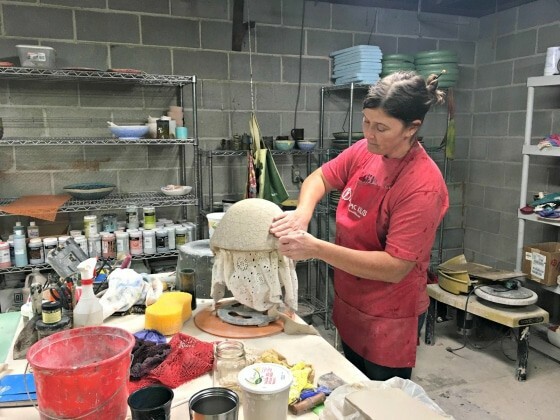 Recently, I visited with four Roebuck Springs potters to talk about their work, the neighborhood, and upcoming shows where people can find them before the holidays. Their names are Jessica Sparks, Nichole Lariscy Moore, Shelleigh Buckingham, and Leslie Martin Smith, of Mud Mama Designs, who also teaches pottery. 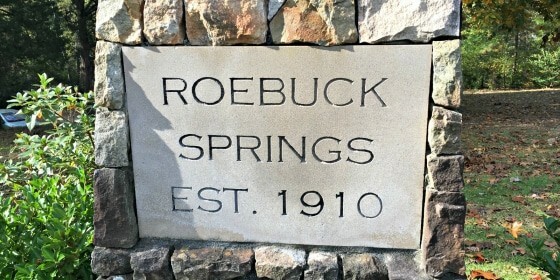 Where is Roebuck Springs, you ask? 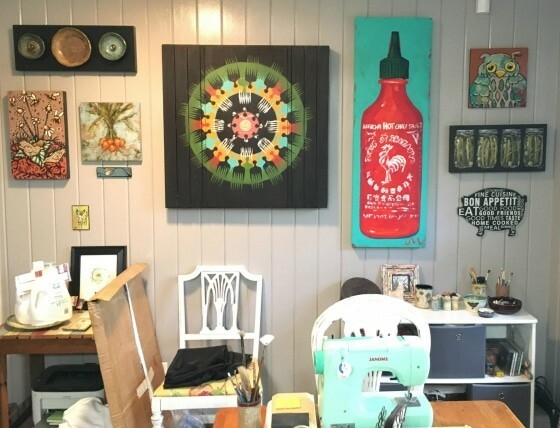 Tucked into the northeastern corner of Birmingham between South East Lake, the back of Ruffner Mountain, and I-59, Roebuck Springs is a quiet, quirky neighborhood filled with a lot of people who like to make things. Artists in this neighborhood are like mushrooms after it rains. One of several stone signs marking the 108-year old neighborhood. Photo by Sharron Swain for Bham Now. 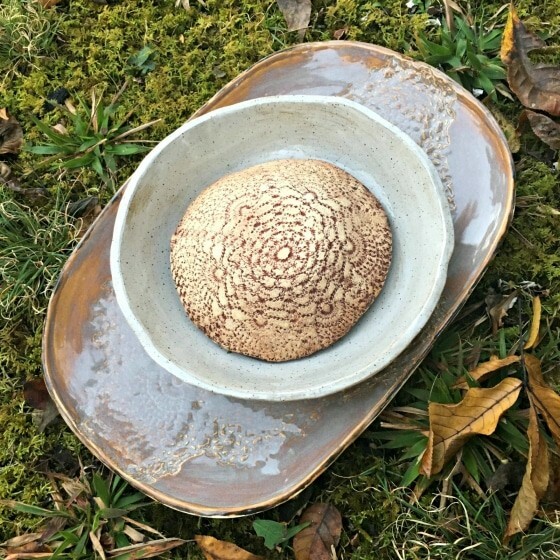 Jessica Sparks enjoys playing with texture and form in her pottery. “I like to make functional things that are pretty.” Photo by Sharron Swain for Bham Now. Jessica Sparks on the porch of her Roebuck Springs home with some of her textured pottery. Photo by Sharron Swain for Bham Now. You’ll find Jessica Sparks showing jewelry at Alabama Waldorf School’s Holiday Faire on Saturday, December 1st, in Crestwood, between 10 am and 3 pm, or find her pottery and jewelry on Instagram @jessicasparksstudio. I love getting out into the art scene and meeting people in a different way. It’s a new kind of Birmingham that I meet. I get to talk to people about art and things that are soothing, bringing joy and color into the world. 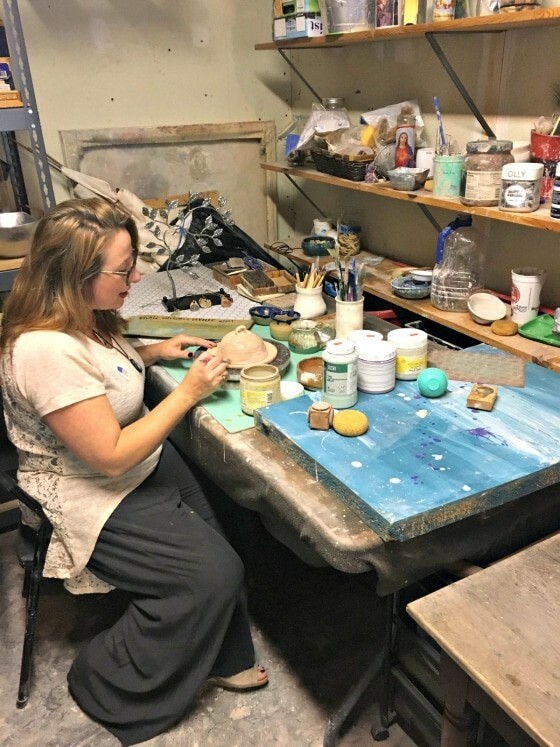 Nichole Lariscy Moore glazing pottery in her Roebuck Springs studio. Photo by Sharron Swain for Bham Now. 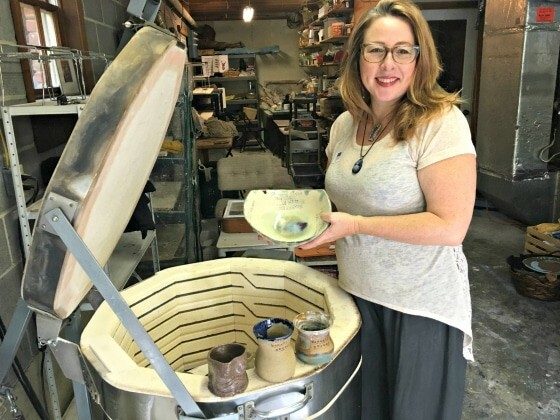 Nichole Lariscy Moore stands by her basement kiln with a selection of her work. Photo by Sharron Swain for Bham Now. You can find Nichole Larsicy Moore’s work at the South Highland Presbyterian Holiday Market this coming Friday, November 9th, from 9-5 and Saturday, November 10th from 9-1, Alabama Waldorf School’s Holiday Faire on Saturday, December 1st from 10-3, and regularly at Alabama Goods in Homewood and Naked Art in Forest Park. You can also find her on Facebook at Indigo Painted Mama. And now, it’s time to meet the third of the Roebuck Springs potters. The moment you walk into Shelleigh Buckingham’s home, you know she’s all about art. Even during the 18 years she was an eye doctor, she still had a keen eye for beauty. Therefore, each wall of her home is adorned with carefully-chosen selections from local artists. One of several art walls in Shelleigh Buckingham’s Roebuck Springs home. Featuring art by Bethanne Bethard Hill, Leslie Lockhart, M. Jones, Darius Hill, Jayne Morgan, S. Buckner, and Shelleigh herself. Also pictured are supplies for making and showing art. Photo by Sharron Swain for Bham Now. 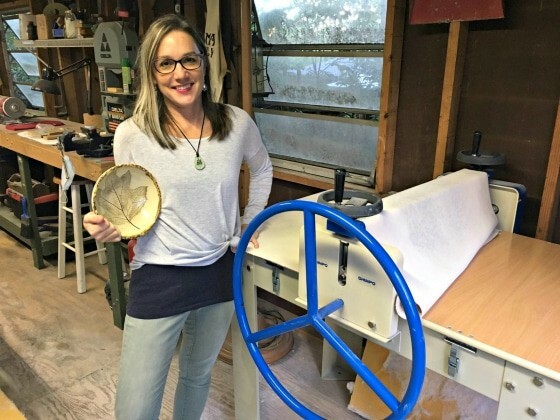 Shelleigh Buckingham in her Roebuck Springs studio with her slab roller and a bowl with a leaf that came from her back yard. Photo by Sharron Swain for Bham Now. 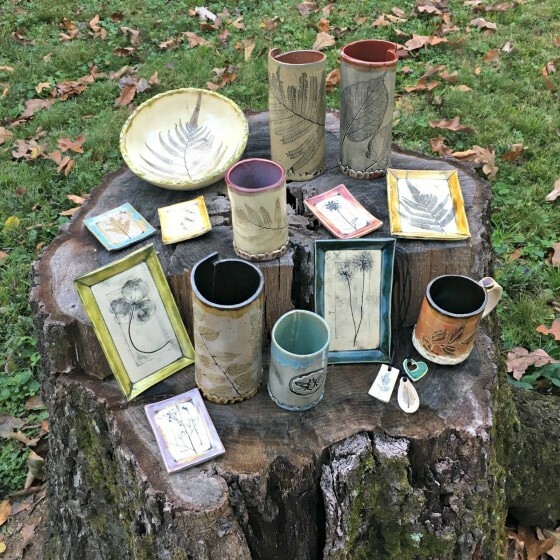 A selection of Shelleigh Buckingham’s pottery in the Roebuck Springs back yard where she finds leaves to press into her work. Photo by Sharron Swain for Bham Now. Making pottery is a lot of fun. 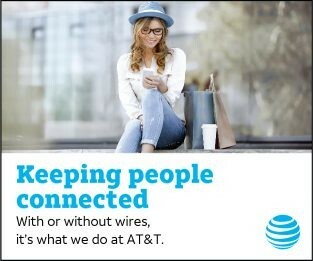 Plus, I love making beautiful things. You can find Shelleigh Buckingham’s work at Brombergs in Mountain Brook, Naked Art in Forest Park, Alabama Goods in Homewood, and on Instagram @shelleigh.buckingham. You can also find her at the 2018 CahaBazaar Holiday Market at Cahaba Brewing Company on Saturday, December 8th from 12-7 pm. Leslie Martin Smith at work in her Roebuck Springs studio. Photo by Sharron Swain for Bham Now. 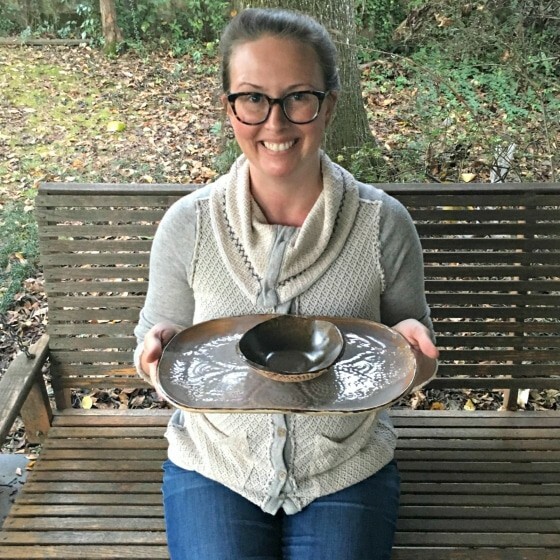 Last but certainly not least, Leslie Martin Smith, the fourth of the Roebuck Springs potters, wears many hats: potter, maker of fabulous concrete countertops, and teacher, among other things. 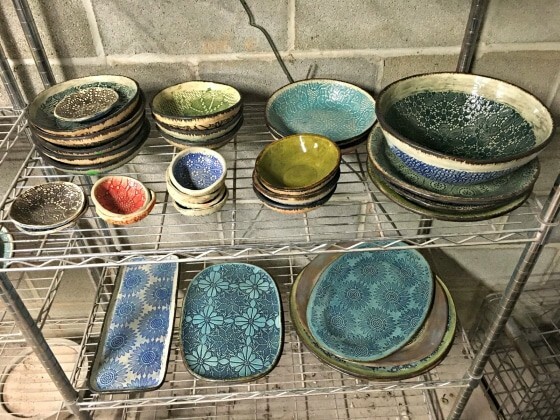 Even with a decade-long detour into concrete, she’s been making pottery for about twenty years. Some finished work in Leslie Martin Smith’s Roebuck Springs studio. 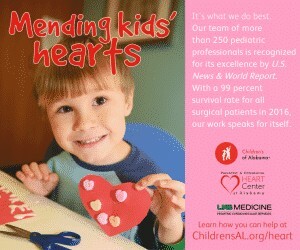 Photo by Sharron Swain for Bham Now. You can find Leslie Martin Smith at Alabama Waldorf School’s Holiday Faire on Saturday, December 1st, from 10-3, and at Pepper Place Market on December 8th. You can also find her on Instagram @mudmamadesigns. 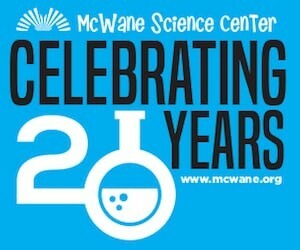 It was a lot of fun getting out to take a look at the behind-the-scenes of my friends and neighbors’ creative work. Now you, too, have the chance to go find these Roebuck Springs potters or their work at seven places around town. And, you’re just in time to find the perfect locally-made holiday gifts for the people on your gift list. If these shows don’t work for your schedule, find them at Alabama Goods or Naked Art (Moore and Buckingham), Brombergs (Buckingham), or on social media.